I can't hear you Bert, there's a banana in my ear. Or a tangerine. 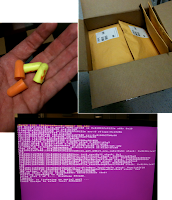 I've been racking and hypervising a render farm, so I ended up with both flavors of earplugs in my pocket on Thursday. The orange 3M ones are seriously industrial grade -- it's a shame they pop out if you try to put a helmet on over them. The render nodes' hardware didn't include power cables, so we added those to our order. HP shipped us forty cables -- each one individually packed in a #5 Jiffypack envelope! So now I've got forty envelopes, and included in each one is a pamphlet inviting me to visit HP's website for information on their environmental initiatives. It's like a black fly in your chardonnay. 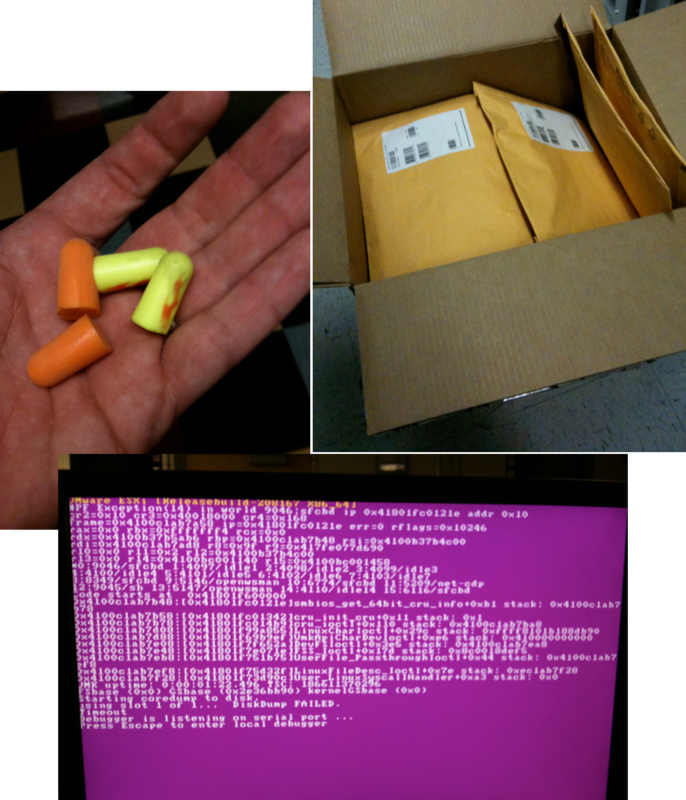 It's lucky that I had twice the earplugs, because I ended up installing twice the vmware. You see, my nodes' hardware isn't "officially supported" for the HP-branded install, but I assumed that I wanted to install HP's branded version of ESXi on them anyway. Not exactly. It installs, and reboots alright, but after two minutes it bluescreens. My first pass, I was just installing and confirming I could reboot, then shutting down each node -- so I installed all forty with the branded hypervisor. When I went to add IP addressing later, they all ran long enough to bluescreen. D'oh! Everything works now, though! I just need to come up with an art project that requires forty padded mailer envelopes. Papercraft armor, perhaps? With a plus ten enchantment against the purple screen of death, plz.